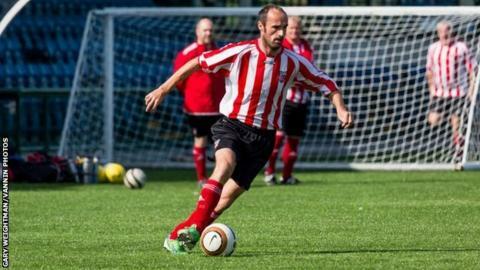 Nick Hurt has been confirmed as the new manager of the Isle of Man senior men's representative side. The 37-year-old former island international succeeds Stevie Burns, who stepped down in October. Isle of Man Football Association chief executive Frank Stennett said he had been chosen for his "passion, enthusiasm and vision". Hurt has previously managed St John's and Michael United FC to promotions, having played for both clubs. He was also part of the Isle of Man side that won the FA National League System Cup in 2006. "I am really excited but I know it is not going to be an easy job," said Hurt. "I'm looking forward to the challenge ahead and I will be doing things my way." The Isle of Man took part in the Uefa Regions' Cup in September, a tournament for the world's top amateur players, by winning the FA Inter-League Cup. However, his first challenge is to prepare a Manx side for the Island Games in Jersey in 2015 and Hurt will be looking to improve the quality of opposition they face in the build-up. Stennett added: "He has won everything domestically as a player and we feel he is the right man for the job. "We are confident he can galvanise our current crop of talented players and help bring success."